Hello, everyone! Here I am, playing with oil again. Nothing crazy, just a spot of shallow-frying... and I've got to say, it's actually quite a wholesome and surprisingly delicate dish, this vegan, gluten-free salt and pepper tofu. I'm popping it into my mouth for a snack... I'm cradling it with gently steamed Asian greens for a meal. It makes a nice little weeknight dinner, or a weekend lunch for one. So tell me... what do you look for in a salt and pepper tofu dish? Light, crispy, and well-seasoned on the outside? Hot, silky and tender on the inside? Something akin to this, perchance? Here, I used fresh Chinese-style beancurd of a semi-firm texture, the type that is usually sold in tubs of water. They're diced and tossed through a salty, spicy blend of rice flour and cornstarch - seriously, try this... it yields a truly fine, exquisite texture - then sizzled till crisp and golden. I also steamed some bok choy, then conjured a dressing with light soy sauce, sesame oil, lemon juice, and freshly grated ginger to go with it. Unfortunately, I didn't note down exact quantities for this - but just taste as you go, that's what I did! 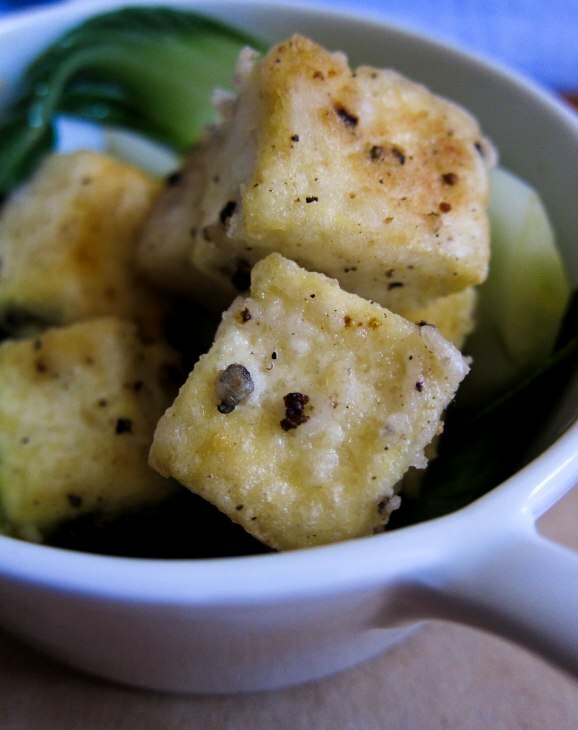 Cut tofu into cubes of 2 - 2.5 centimetres. (Approximately an inch or slightly under.) Whatever you do, just try to make sure they are all of similar size to ensure even frying later. Thoroughly mix all other ingredients (except the oil) together to create a gluten-free salt-and-pepper flour blend. Toss tofu cubes through the flour blend, making sure they are coated on all sides. Divide into four batches. Pour oil into a small frying pan to a height of about 1 centimetre (1/2 inch). Let the oil warm rapidly over high heat for about 30 seconds, then fry the coated tofu cubes a batch at a time, turning, until golden and crispy on all sides. Retrieve the tofu and drain off excess oil on paper towels. Loosely sprinkle with an extra pinch of salt, if desired. Serve with vegetables, and perhaps a dollop of rice, and you've got yourself a complete meal! I love the blend of pepper you use. I adore salt & pepper tofu - I like mine crisp outside and custardy in the middle. Is it allowed to have tofu cravings? Because I think I do now. What a beautiful dish! Thanks for sharing. Woo! I can comment now that I'm at a desk :) This is totally my kind of tofu - love the crispy outside and silky inside, yum. This looks delicious and healthy Leaf. I wonder if you toss and coat it thoroughly with oil, would it be an alternative to try baking them on a grill tray to until they are golden brown and you can also render the oil at the same time? I find baking sometimes give a more consistent crisp on the outside. Thank you for reading, Anh! Thanks Yas! I wonder why commenting from your mobile doesn't work, hmmm. Great minds think alike, Michelle! Did you blog about it? I just did a search but couldn't find your version. Hey Chopinand, baking might work, perhaps with some experimentation. I would probably prefer shallow-frying though - I found it to be really easy and effective in this case, and I loved the results! I am so going to make this dish with some garlic ginger bok choi and sticky rice. Oh thank you for a great dinner idea. YUM! Now you got me thinkin....tofu starters for my gathering this weekend! I've never served them before so it would be good to deviate now and then! Mmmm spicy tofu:) Interesting recipes. The tofu looks perfectly crisp!! I will have to try that cornstarch/rice flour coating combo next time I fry tofu. It looks absolutely delicious. Oh wow! Ever since I had my little health problems, I switched on a fully ovo-lacto-vegetarian diet and this is simply perfect. I have to try it out tonight! :) Thank you for this delicious recipe! Leaf! This looks so lovely! It could also be awesome as a cocktail food served with little toothpicks to scoop it into your mouth! I hope you enjoy it, Marie-Anne! Thanks Anna! That is an excellent idea! I love tofu, but I can't get my family to touch it. I'll give your method a shot and not tell them it's tofu, the color is amazing and the recipe sounds delicious! I love salt and pepper tofu. Yours look so perfect lightly coated and paired with pak choi, yum! I am not usually into tofu but when it is fried, this is an entirely different food. Delicious! Thanks Intolerant Chef - even though it's not a dietary issue for me, the gluten-free is a bonus indeed, and I love using rice flour anyway. Mmmmmm I love tofu. This looks good! I'm making this tonight. Turns out I don't have rice flour, so I am going to sub some tapioca starch. Lovely recipe with tasty flavours, I would definitely make this. Tofu is one of those things I never know what to do with apart from throwing some in miso soup. How lovely to find your blog! 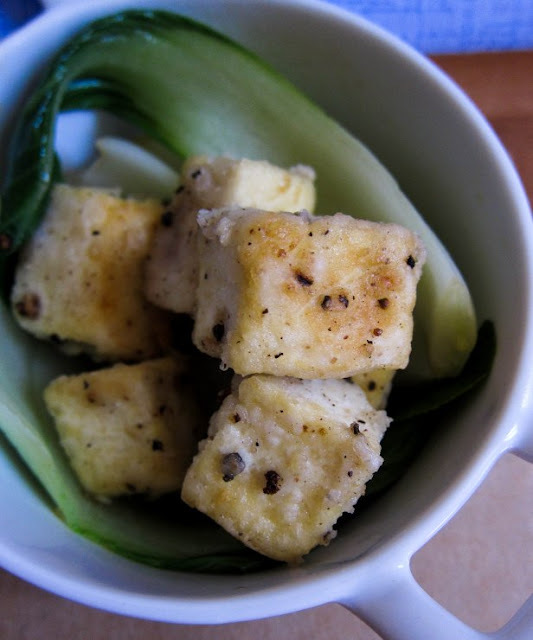 I absolutely adore salt & pepper tofu, something which I've only started to make at home myself. I like to use silken tofu because I love the soft, wobbly interior. I like your idea of seasoning the riceflour and cornflour because I season after frying. Can't wait to try your recipe!